The Darkest of the Hillside Thickets is a rock band from Chilliwack, British Columbia, Canada. Their music largely consists of often tongue-in-cheek homages to the works of H. P. Lovecraft, specifically the Cthulhu Mythos. The Darkest of the Hillside Thickets formed in January 1992 after meeting at Fraser Valley College in Abbotsford, British Columbia. Lead singer Toren Atkinson and lead guitarist Warren Banks formed the band so they could open for local group Mystery Machine. Even though they "had no musical training or experience" they were able to create a three song set list and play the opening act for their first show. In their early years the band produced three demo tapes: Gurgle Gurgle Gurgle', Hurts Like Hell!, and Cthulhuriffomania. Most of the songs were later re-released on other albums. In 1996 the band released Great Old Ones. In 2000 the Thickets released Spaceship Zero: Original Motion Picture Soundtrack. The singer Toren said the album was "heavily inspired by the science fiction movies and reruns we’d all grown up with like Lost in Space and Angry Red Planet". In 2002 the Thickets collaborated with Wizards of the Coast to release Let Sleeping Gods Lie - an all-Cthulhu Mythos themed CD. The album was used to promote Wizards' new d20 edition of the Call of Cthulhu role-playing game. The album contained twelve previously-released Thickets tracks, and had a special tie-in with the Call of Cthulhu game rules. If the CD is played during a roleplaying session, the game contains rules for die roll modifiers that take effect depending on what song is currently playing. The Shadow Out of Tim is the Thickets' second theme album, after Spaceship Zero. The title is a play on words from the H.P Lovecraft short story The Shadow Out of Time. The album is an adaptation and a rock opera based on Lovecraft's story. The album recounts the tale of a marine biologist who found his body had "been possessed by an alien intelligence" and works to find out what happened. The album was released at the Summer Solstice (June 21) 2007. Among the songs recorded during The Shadow Out of Tim sessions were "Shhh...." and "(We're Gonna) Kill the Chupacabra (Tonight)." They were not included on the album as they "didn’t fit in with the [album] narrative". Both we're later released on The Dukes of Alhazred. In 2009 the Shadow Out Of Tim song "Blackout" was nominated for the 8th Annual Independent Music Awards for Hard Rock/Metal Song of the year. In 2008 the Thickets were invited to play at the Penny Arcade Expo. 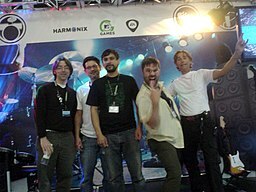 Their performance at the event led to their previously unreleased song "Shhh...." being included as a downloadable track in the PAX 2008 Collection for the video game Rock Band. The song was also included on the "Child's Play CD 2008" compilation. In March 2016 the Thickets launched an Indiegogo campaign to fund creation of a new album. The album successfully funded later that year. The album was released in 2017 with the title The Dukes of Alhazred. A Stranger Aeons review said "If you like some catchy rock with your cosmic horror, The Darkest of the Hillside Thickets are your guys!" The original three members of the band, at the January 1992 formation, were Toren Atkinson, Warren Banks and Quentin Rogers. Quentin, though, never appeared on any of their releases, nor played at any of their public performances. The first bass player to appear with the band at a show was Devon Presseau. The band has gone through several bassists and drummers since its inception. Thomas R. Falk has toured and played with the band as a second guitarist. The discography below details band member history. The current line-up of the band consists of vocalist and lyricist Toren Atkinson, guitarist Warren Banks, guitarist/bassist Mario Nieva, drummer Jordan Pratt (former drummer for the band Mystery Machine), and bassist/backup vocalist Merrick Atkinson. Outside the band several members have other artistic side projects. Lead singer Toren Atkinson co-hosted a science/comedy podcast named Caustic Soda. Drummer Jordan Pratt, former bassist/video director Bob Fugger, and former guitarist Chris Woods formed and co-hosted comedy podcast Speedway Squad. Upon Fugger's departure, Pratt and Woods were joined by Thickets guitarist Warren Banks to create a new podcast, Horsetrack Hooligans. Outside of the band, Toren Atkinson is also an artist, having illustrated books for role-playing games including Dungeons & Dragons, Call of Cthulhu (and Delta Green), as well as the Lovecraft-inspired collectible card game Mythos. Warren Banks and Toren Atkinson also co-wrote (along with contributions by John Scott Tynes and Monte Cook) the roleplaying game Spaceship Zero, published by Green Ronin Publishing. A large part of The Thickets live shows involves the band members wearing "imaginative and bizarre" stage costumes. The outfits are usually Cthulhu Mythos-themed. The band has gone through various iterations over the years, from plush gug and fungi from Yuggoth outfits to the red jumpsuit/astronaut motif for their Spaceship Zero concerts, to their Satyr costumes, and most recently, their early twentieth century nautical styles featuring mustaches. Lead singer Toren Atkinson classified the Thickets' music as "rock and roll" and "power pop". Toren notes that they try to be creative and original with their music and ideas. "One thing I’m proud of ... is that while we don’t necessarily take a Lovecraft poem or story and directly put it to music ... [our songs are] steeped in Lovecraftian lore. We make ... the Cthulhu Mythos our own by putting it in a more punk-rock milieu and a distinctly new, and often tongue-in-cheek, place". In "The Strange Sound of Cthulhu: Music Inspired by the Writings of H.P. Lovecraft", Gary Hill described "One Gilled Girl" from Great Old Ones as "The Ramones take on H. P. Lovecraft". Hill describes several Thickets songs as having "thrash and punk influences merge". Several reviewers have specifically called out praise for the Thickets' song lyrics. A review in The Unspeakable Oath said "the lyrics really are what sets this band apart". For his part, lyric author Toren Atkinson said "I like to challenge myself when writing music. I love playing with language". While the singer Toren admits to writing "95% of the band's lyrics", he attests that the rest of the Thickets' creation process is a group effort. "Usually when we practice, one or more of us will come with some melodies and riffs we’ve cooked up over the past couple weeks, and we 'jam it out' until we either get a song or we get sick of it". He also notes that the band uses deadlines as external motivation to create: "As a collection of lazy procrastinators, we will usually 'throw our hat over the fence' by booking time at a recording studio. Then we have x months/weeks to come up with an album". Toren notes that they also reach out to the Thickets fan base for help when they need special subject expertise. "For example, for "The Math Song" and "Dies Ist Unverschamtheit" I had a brain friend help me with the algebraic equation and the German lyrics, respectively. On The Shadow Out of Tim, I put the call out ... for help with writing the Middle Egyptian lyrics". The Thickets have toured across North America a few times, performing with such bands as GWAR, Dayglo Abortions, MC Frontalot, Freezepop, BlöödHag, Bad Brains and Nomeansno. They played at Dragon Con in 1997. The Thickets opened for They Might Be Giants at GenCon in 1998. They were invited to play at the first annual H. P. Lovecraft Film Festival in 1996, and returned to play at the festival for three years afterward. They returned again to play at the festival in 2008 and Anime Evolution in 2010. Gurgle! Gurgle! Gurgle! (1992, cassette). Hurts Like Hell! (1993, cassette). Cthulhu Strikes Back (1995, CD album) – Reissued 2003 as a Special Edition with two extra tracks. Great Old Ones (1996, CD album) – Re-release of material from Hurts Like Hell and Cthulhuriffomania, with a few additional tracks. Spaceship Zero: Original Motion Picture Soundtrack (2000, CD album). Let Sleeping Gods Lie (2002, Special issue CD compilation). The Shadow Out of Tim (2007, CD). The Dukes of Alhazred (2017, digital download & CD). Fraser Valley Champions (1994, CD compilation). Collections and Conceptions for the Critically Confused (1994, CD compilation), Closet Rock Entertainment. Fight Prime Time (1996, CD compilation), Kathode Ray Music. Tombstone Park (1998, CD compilation), Reanimator Records. For Lucio Fulci: A Symphony of Fear (1999, CD compilation) – 11. "House Of Clocks". Weird Fiction Horror Comp (date unknown, CD compilation), Valiant Death Records. Child's Play CD 2008 (2008, CD compilation), Penny Arcade Merchandise. Hymns From the House of Horror, Vol. II (2011), Rue Morgue – 1. "Shhh..."
Fort Zombie – "Ride the Flying Polyp" (instrumental). Toren Atkinson also supplied voice acting. "Worship Me Like A God" (1993) – Directed by Bob Fugger. Played at the H. P. Lovecraft Film Festival in 1997. "Colour Me Green" (1995) – Directed by Bob Fugger. "20 Minutes of Oxygen" (2011) – Directed by Mike Jackson. Bloodsuckers (2005) – "Slave Ship"
"The Sounds of Tindalos" and "Slave Ship" appear in the trailers for the video game Sword of the Stars, for which Toren Atkinson also supplied voices. Chapter ten of Gary Hill's "The Strange Sound of Cthulhu: Music Inspired by the Writings of H.P. Lovecraft" is titled "The Darkest of the Hillside Thickets: Lovecraftian Humor Set To Music". According to the introduction of My Tank Is Fight!, author Zack Parsons says he took the title from a song by The Darkest of the Hillside Thickets (a verse of the song "My Tank"). The lyrics to "The Math Song" appear in calculations on a chalk board in an episode of the cartoon series Rocket Monkeys. The Laundry RPG contains a scenario called "Going Down To Dunwich", quoting the two first verses of the song of the same name in its introduction. ^ a b z (September 10, 2008). "Don't Tell The Jocks: Geek Dad Interviews Toren Atkinson". Wired_(magazine). wired. Retrieved August 25, 2018. ^ a b c d e f g h Gates, Michael (November 13, 2009). "The Syncopated Call of Cthulhu: An Interview with Toren Atkinson, Lead Singer for The Darkest of the Hillside Thickets". thickets.net. Retrieved August 25, 2018. ^ a b Mussbacher, Ashley (March 5, 2012). "Q&A - The Darkest of the Hillside Thickets - The Cascade". ufvcascade.ca. Retrieved August 29, 2018. ^ a b c d e Leeson, Kevin (December 1, 2006). "Interview with the Thickets (PDF)". Absolute Underground. Vol. 3 #1 no. 13 - December / January 2006-2007. Victoria, British Columbia: Hidden Forces Publishing. p. 18. Retrieved September 14, 2018. ^ a b c d Atkinson, Toren. "Music - The Darkest of the Hillside Thickets". thickets.net. Retrieved August 27, 2018. ^ "Cthulhu Strikes Back Special Edition". thickets.net. Retrieved August 27, 2018. ^ "Great Old Ones (1996) - The Darkest of the Hillside Thickets". thickets.net. Retrieved August 27, 2018. ^ "Soundtrack - Spaceship Zero". spaceshipzero.com. Retrieved August 27, 2018. ^ a b c d "Interview: The Darkest of the Hillside Thickets". innsmouthfreepress.com. October 8, 2009. Retrieved August 29, 2018. ^ a b Smith, Mat (February 1, 2002). "Wizards of the Coast - In The Works (February 2002)". wizards.com. Wizards of the Coast. Archived from the original on June 5, 2002. Retrieved August 26, 2018. when you pick up an autographed copy of Call of Cthulhu from our online store, you'll also get a limited-edition compilation CD by a band called the Darkest of the Hillside Thickets. ^ ""The Shadow Out of Tim" Album Street Date is the Summer Solstice!". thickets.net. May 2007. Archived from the original on July 22, 2011. Retrieved 2007-06-01. ^ Megashaun (September 29, 2009). "Popshifter - The Darkest Of The Hillside Thickets: An Interview With Toren Atkinson". popshifter.com. Retrieved August 29, 2018. ^ Gabe (July 30, 2008). "New - PAX 2008". Penny Arcade. Retrieved August 27, 2018. ^ Crecente, Brian (August 30, 2008). "PAX Pack Brings Nerdcore to Rock Band, Donations to Child's Play". Kotaku. Retrieved August 27, 2018. ^ a b z (December 18, 2008). "Child's Play CD 2008: Music for Charity". wired.com. Retrieved August 27, 2018. ^ Atkinson, Toren (Mar 16, 2016). "The Darkest of the Hillside Thickets 5th Album - Updates". indiegogo.com. Retrieved August 26, 2018. posted by Toren Atkinson Mar 16, 2016 "Wow! We're at 75% of our goal already!" ^ Segers, Guido (May 10, 2017). "Review - The Dukes of Alhazred". stranger-aeons.com. Retrieved August 27, 2018. If you like some catchy rock with your cosmic horror, The Darkest of the Hillside Thickets are your guys! ^ "About - Caustic Soda". CausticSodaPodcast.com. Retrieved August 29, 2018. ^ "About us - Horsetrack Hooligans". horsetrackhooligans.com. Retrieved August 29, 2018. ^ "The Whisperer Interview - Darkest of the Hillside Thickets". thickets.net. October 17, 2003. Retrieved August 29, 2018. ^ a b c Gary Hill (2006). "10: The Darkest of the Hillside Thickets: Lovecraftian Humor Set To Music". The Strange Sound of Cthulhu: Music Inspired by the Writings of H. P. Lovecraft. p. 147-154. ISBN 978-1-84728-776-2. Retrieved 27 August 2018. ^ Klepac, Christian (1997). "Cthulhu Strikes Back - Review". The_Unspeakable_Oath. Retrieved August 31, 2018. ^ "Event Archive - The Darkest of the Hillside Thickets with BloodHag and the Boss Monsters". artsvictoria.ca. February 7, 2009. Retrieved September 11, 2018. ^ "Darkest of the Hillside Thickets w/ BloodHag". livevan.com. February 7, 2009. Retrieved September 11, 2018. ^ "Darkest of the Hillside Thickets - H.P. Lovecraft Film Festival & CthulhuCon". hplfilmfestival.com. 2008. Retrieved August 28, 2018. ^ "Anime Evolution 2010 >> Music". animeevolution.com. 2010. Archived from the original on June 7, 2010. Retrieved August 30, 2018. ^ "Hymns From the House of Horror Vol. II". rue-morgue.com. June 2011. Archived from the original on 2011-06-23. Retrieved 2011-06-21. ^ Hothead Games (October 29, 2008). Penny Arcade Adventures: On the Rain-Slick Precipice of Darkness: Episode 2. Windows. Hothead Games. Scene: Ending credits (1m 15s). "Some Things Man Was Not Meant To Know" performed by The Darkest of the Hillside Thickets. (c) The Darkest of the Hillside Thickets. Courtesy of Divine Industries, Inc.
^ Fugger, Robert (1993). "Worship Me Like A God - The Darkest of the Hillside Thickets". youtube.com. Retrieved September 4, 2018. Toren Atkinson: 'This is circa 1993, Chilliwack BC Canada. dir: Robert Fugger'. ^ Jackson, Mike (February 19, 2011). "20 Minutes of Oxygen - The Darkest of the Hillside Thickets". vimeo.com. Steam Powered Films. Retrieved September 4, 2018. A sci-fi music video for the Darkest of the Hillside Thickets, from their album Spaceship Zero.